Nikita is a Junior studying International Studies and minoring in Business. She hopes to either pursue a career in Human Capital Consulting or Brand Management. Nikita believes POS is the groundwork for transparency, productivity, and engagement in organizations. She is excited about POS because she believes it is a mindset which inspires others to be their best selves personally and professionally. 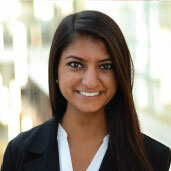 Nikita is energized to see POS creating positive change agents and leaders in organizations. Outside of the Center for Positive Organizations, Nikita is currently Vice President of an on-campus consulting club, Apex Consulting Group, a Marketing Coordinator of Dance Marathon at the University of Michigan, and a Campus Tour Guide at the Office of Undergraduate Admissions. She is passionate about impromptu speaking and hopes to complete a 1600M open water swim before graduation.